In San Antonio, the project benefitted The Texas Ramp Project, an organization that has built more than 10,000 wheelchair ramps since 2006 for elderly and disabled clients. Approximately 60 Weekley team members from the company’s San Antonio Team, along with a few family members and a vendor partner, volunteered more than 330 hours to build six ramps for families with medical needs who lack the financial resources. 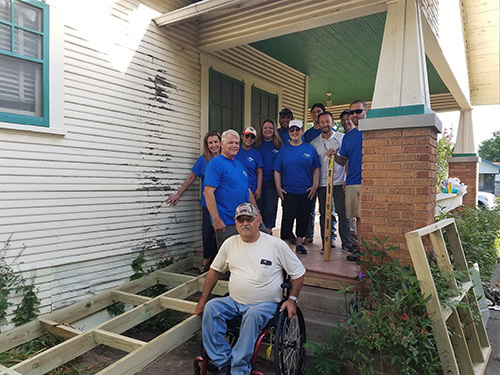 “We are thankful to David Weekley Homes for building wheelchair ramps during the month of June,” said Bruce Johnson, San Antonio volunteer coordinator with The Texas Ramp Project. “With this help, we have installed 87 much-needed ramps in Bexar County during the first half of 2017. This project benefitted six families by providing a ramp that will enable these clients to leave their homes without assistance. The project also included a $2,000 donation to assist with the purchase of another trailer to transport ramp components for future jobs. Build Month: David Weekley Homes team members pose with a client as they work to complete a ramp for The Texas Ramp Project.